Ron George: Modern Bicycles and Cycling Speeds : Any Measurable Relation? Modern Bicycles and Cycling Speeds : Any Measurable Relation? Its not about the bike. Or is it? Without a shadow of doubt, most of us will say that today's Grand Tours are faster than those of the past. True. For instance, since its inception in 1903 to the 1990's, the Tour de France had seen its winner's average speed increase some 50-55% as this site will show. But here's the big question - how much of that speed increase came from bicycle improvements alone? If you don't factor in the contributions from all other things- temperature, course, race tactics, improved training methods, nutrition and doping - what role does bicycle technology alone have to play in higher speeds? Is it significant to be appreciated? This most entertaining problem is one that maybe analyzed with a technique called multiple regression. This method, a staple in any statistician's arsenal of tools, allows one to estimate the effects of many factors on a single dependent variable, in our case - cycling performance. For starters, there are a number of independent variables that factor into a favorable cycling performance. I have shown these factors diagrammatically below. 2. Technology Related - Bicycles, fancy apparel etc. We'll disregard other things and consider just bicycles. 3. Race Specific - Course, weather, tactics employed, rules, etc. 4. Random Events (Noise) - Example - a freak crash 2 km from the finish line that injured many riders, a neutralized stage due to the death of an athlete, any day to day variation that cannot be predicted but is present. In 100 years of cycling history, innovations have come and gone. Some have stuck through to Grand Tour racing, the list of which is mandated by the final word of the UCI. To consider the effect of just bicycle technology alone on cycling speeds, a multiple regression analysis has to be performed. You would require lots of data for many years and a handy computer to make some meaning out of it. Unless someone gives me serious money, I won't be diving into such an endeavor. But recently, Ph.D's Jan Heine and Mark Vande Kamp who write for the magazine Bicycle Quarterly sought to answer this question in their article titled "Are Modern Bicycles Faster? 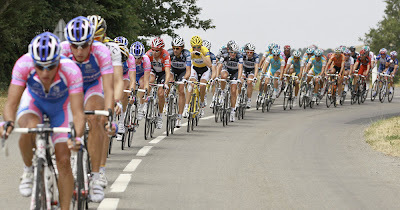 An Analysis of Tour de France Speed". To me, the article appeared to be a logical investigation of why speeds increased in the Tour and whether they could be explained by the latest racing bikes. The article had ignited controversy in cycling circles about its apparently "flawed" analysis. I think it will be to everyone's benefit if the strategy of the article's investigations are clarified first and foremost. We'll then explore its conclusions. 1. Fundamental assumption : The fundamental assumption that the authors imply, but which is not stated explicitly in the article, is that all modern bicycles and related technology are introduced into the market to strictly increase cycling speeds. With this assumption, they proceed to quantify how much that speed increase is. 2. Eliminate day to day performance variations : They selected the Tour de France as the main race of interest with this notion that multiple stages and over 150 riders will eliminate the influence of day-to-day variations in fitness, weather and other factors on individual performance. 3. Eliminate course specific variations : With the view that courses change "somewhat" in the Tour de France, they selected the Milan-San Remo as a supplement in the analysis as the race has been run on the same course for over a 100 years without change. The race's difficulty has also been consistent since smooth speed curves have been displayed for over a century. 4. Separate human performance improvements from bicycling technology improvements : This one is tricky so pay attention. The authors wanted another race as a control to compare cycling with. They thought of a race from another branch of endurance sports that had little to do with technology or inconsistent conditions and where performance was mostly limited by the "human factor". They selected medium distance running, specifically the 5 and 10 km running race from all events worldwide and studied trends in running speeds. The logic? If bicycles have truly become faster, the trend line for cycling speeds in the Tour would deviate from that of human speeds in running by showing step increases. If bicycles have not become faster, the trend lines should closely match each other due to the "human factor" common to both endurance sports. 5. Regression Analysis : Using the data of speeds, a regression analysis was performed on the Tour de France and running speeds for the last 100 years. The "athletic performance" regression lines would show the long term speed trends for both races. This was made into a "Chart 1". "Chart 2" was also made where the authors smoothed TdF and 10 Km running speeds for many years by taking a 5-year running average. These curves were compared to each other and to the long term "athletic performance" regression line in Chart 1. 1. Co-relation between actual TdF speeds and speeds predicted by the runner's trend line was 0.94. Strong. 2. Co-relation between actual running speeds and the long term running speed trend line was 0.95. Also strong. 3. 88% of increases in TdF speeds over the last 100 years can be explained by improved athletic performance. 4. For both running and cycling, there appears to be an unexplained 9-12% that are simply random occurrences seen when athletes compete. 5. The regression curve (or line fit) for TdF speeds have a shallower slope than that of running indicating that cycling speeds increased at a slower rate. The authors propose that this is due to wind resistance factor in cycling as power demand increases by the cube of velocity. But the non-linearity of aerodynamic resistance is not much, it is instead minimized in the Tour de France and spread over a large group of riders. 6. Over the last 20 years, TdF speed increase trends parallel that of runners' speeds. Technology has had minor roles to play in these achievements according to the logic in the analyses (no step increases were observed). 7. There were steeper speed increases in the TdF in between 1926-1940 than running speeds during that time. The early 1920's saw periods of low performance and the authors propose that World War I had depleted the pool of cycling champions taking part. The late 1920's, however, showed a marked speed increase was not observed in the Milan San Remo which got the authors to conclude that something particular to the TdF caused these increases. They propose the radical shortening of stage distances as a possible reason. There were pronounced speed increases in the 1930's that corresponded well with the significant, revolutionary and long term changes introduced on racing bikes such as lightweight steel frames with thinwall tubing. The authors state that of all advances, lightweight steel frames had the most pronounced effect on Tour speeds. These speed increases were also observed in the Milan San Remo in the 30's as well, indicating that this was a sport-wide phenomena. 8. Since 1947, speed increases in cycling, relative to runner's speeds, came during times when cycling technology did not even change. The late 1950's saw a jump in cycling speeds but nothing significant was invented or innovated in bicycles during that time, since the introduction of Compagnolo's rear derailleur in 1951. Since speed increase came at a time when technology was stagnant, the logical conclusion is that speed increase cannot be explained by technology. The authors state that other reasons, like the paving of roads, may have been primarily responsible. 9. In the early 1980's, TdF speeds increased between 1981-1982 without a rational reason and then dipped down without an explainable reason as well. Between 1985-1990, time trial bikes, such as those used by Greg Lemond in his 1989 Time Trial did increase stage speeds but the time trial stages were too short to influence overall speed of the entire Tour. Moreover, the bikes used in mass-start races "evolved little" during this period, wrote the authors. 10. From 1999-2009, lots of things in bicycles evolved - from index shifting, to rear cassettes, increased gearing, aerodynamic wheels and ceramic bearings. Sure, the speeds of the Tour de France saw an almost linear increase as well. But what the authors found was that the long term trend of running speeds tracked this increase in cycling speeds very closely indicating that almost all these improvements can be tracked to physiological factors common to both running and cycling. Since 2005, speeds started to drop below the predicted trends, possibly indicating that strict doping controls are responsible for the lower speeds. Speeds decreased 3.5% from their peak, while running speeds decreased only 1.8%. This shows that something not common to both sports have influenced the speeds in cycling. "It is tempting to look over the Tour de France speed curve and pick [technology] factors that appear to have caused increases or decreases in speeds. [...] However, when taken in the context of all the data, these specific examples don't add up to a compelling case that bicycle technology increased Tour de France speeds. Neither of them stand up to close scrutiny. [...] Across the whole timeframe of the last 100 years, even radical changes like the introduction of the derailleurs did not alter the trend of Tour de France speeds. Clearly, the larger pattern suggests that bicycle technology has had little, if any, effect on racing speeds, especially in recent decades." 1. Choice of control : Why was medium distance running chosen as a control and not ...say, the marathon? I don't know. The authors don't provide an explanation for this deliberation, although they suggest that the medium distance races do not see much "influence of technology". So does the marathon see influence of technology then? I don't know. You would think not. Long distance running, to me, is the purest form of endurance sports. It would be interesting to see if marathon running speeds closely followed all the trends of cycling speeds for the past 100 years. 2. Choice of race : One will agree that are simply too many variables in the Tour de France to make a valid relation between one aspect, such as cycling technology, and another aspect, cycling speeds. Why not extend the research to a solo performance such as the hour record where variability is reduced even further? Or a time trial? Or a sprint? In a past post, I revealed details of a study that found that between 1980 and 1990 before UCI regulations came about, 60% of cycling hour records in the discipline were solely due to engineering. The authors may want to catch up with that. 3. What to investigate : The authors start off the article by asking the question - how much faster are the lastest racing bikes compared to classic machines? But it seems that throughout the article, they tend to look at small innovations across years such as the rear derailleur, or increased gearing, or thin walled tubing to see if they made an effect on the "overall" speeds of each year's Tour. How could does a tiny component translate to anything appreciable in the overall speeds across successive years? Rear derailleurs or improved front brakes alone don't make any appreciable change to Tour de France speeds across successive years. 4. Details of each stage : The exact details of each stage were not investigated by the authors. It would be interesting to see how many flat stages and how many mountain stages each Tour so far consisted of and how gravity would play a role in changing outcomes. Data may be tricky to find. Now keep in mind that we do have data for the speeds, distances, number of entrants and number of finishers in each of the Tours. Perhaps blending all this information into one graph for different eras of cycling may lend some insight. You may be able to come to some kind of understanding about what was going on in those 7 years. For instance, during 1980-1982, speeds increased drastically. It is also interesting to see that between 1980-1981, the number of participants who finished the race had also risen and the distance in Km of the race had fallen, although the number of stages were increased from 22 to 24. It would be interesting to superimpose the percentage of km in uphill roads and downhill roads on this graph for those years. It would also be interesting to see how the "Badger's" temperamental tactics and pace control influenced the speeds in those years. 5. Successive yearly investigations vs leaping : Based on the initial question posed, it would be more meaningful to take a vintage racing bike and a modern racing bike and compare the two. Hypothetically, a 1903 racer traveling across a period of 100 years into the future to ride the Tour de France on a 2010 race bike with a lighter frame and aerodynamic wheels should be faster. Similarly, a group of 1903 racers climbing a 2 hour long Alpine climb on 40 pound steel bikes would be slower than the same group of racers riding on flyweight machines of similar sizes in similar terrain. It is basic physics. Investigating this issue year by year, where all riders would have access to the same bikes and the same technology won't show you clearly how cycling technology is improving overall Tour speeds, if they do at all. Besides, some modern equipment and technical wear don't always serve to increase speed solely. Some of them have intangible benefits as comfort and so on. That is an advantage when you stay seated in the saddle for 90 hours of racing. Overall, I don't think this is as bad of a study as many people think. Besides, it was published in a popular magazine to open up a forum for discussion. It is not a rigorous scientific white paper. I do agree with one thing that studies like this discover time and time again - that majority of racing performance is related to the human body. Racing is never a level playing field, no matter what race it is or how much you want to complain - be it the Berlin Marathon, or the Tour de France, the 24 Hours of Le Mans or the Baja 1000. There's always those few individuals genetically gifted or blessed with the finances and talent needed to win. Then there are those who cheat to win. They may have the talent, but they want to boost it with some extra energy from extraneous sources, illegal by all rules. Kamp's and Heine's study corresponds with several people's observations that cycling speeds have been coming down since 2005 due to doping regulations. In July during Tour time, I had done my own analysis of this Stage 17 power to weight ratios and my approximate figure of 6 W/kg agreed with other people's observations, among them the Science of Sport bloggers (see their article). In the end, we may never know exactly what portion of those early TdF speed increases were "fabricated" through cheating. How much came from Amphetamine use, or alcohol, or narcotics, steroids, growth hormones, EPO and blood transfusions or using mechanical devices? Food for thought? What do you think? Come discuss this article and its implications!